Oh, how I love an infographic that packs all the information I need into a handy, at-a-glance reference! 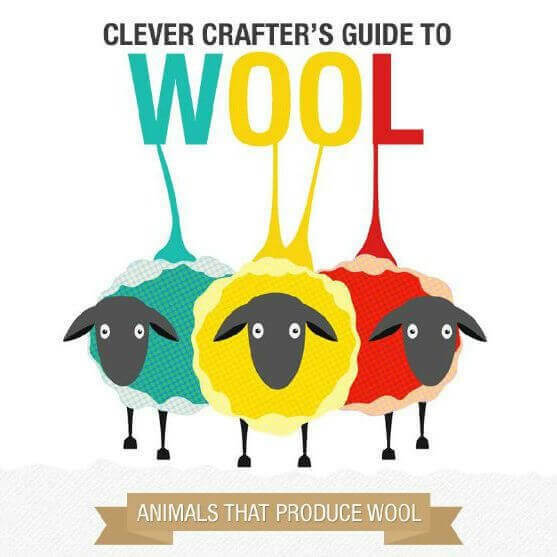 The folks over at Clippers Ireland put together this Clever Crafter’s Guide to Wool and I just knew you would appreciate it just as much as I do. Below you can find some fun wool facts (did you know camel hair is the warmest?! ), a very handy yardage estimator for your next project (it takes the wool from 7 sheep to make an afghan! ), a wool weight cheat sheet, and a quick reference to specialty fibers. Pair the guide to wool infographic with this Yarn Weights Chart for even more information on yarn weights, recommended hook and needle sizes, and gauge ranges. Infographic printed with permission from Clippers Ireland. For ease of use, below I have included a text only version of the Clever Crafter’s Guide to Wool. Please note that yardage requirements listed in the guide to wool are only estimates and vary depending on the size of project as well as if the project is for knit or crochet. For more detailed information on yarn weights, recommended hook and needle sizes, and gauge ranges see this Yarn Weights Chart. Only large people need 2100 yards of worsted-weight yarn for a sweater. And one sheep yields much more than 500 yds of worsted weight wool. It is easier to compare weights – an average sheep fleece, after cleaning and fiber prep, yields at least 4-5 lbs of usable wool. Worsted weight yarn is about 1000 ypp (yards per pound). So an average sheep fleece should yield more like 4000-5000 yards of worsted weight wool. A good rule of thumb is that you can often get 2 men’s sweaters out of one sheep fleece. This is wonderful, Kara! Thank you so much for posting this. It is very interesting to see the comparison of with the number of sheep required per yard . . . . . very clever graphics. Thank you so much for this. Fairly new to knitting & crochet and inherited a stash of unmarked yarn!